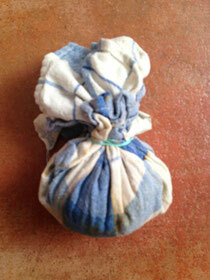 Place herbs on kitchen towel or muslin. 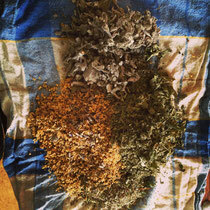 Here I am using elderflower, thyme, sage, lemonbalm, peppermint, yarrow. Elderflower: is used in traditional medicine as a diaphoretic, which means that it induces sweating. Sweating is an important temperature regulatory and detoxifying mechanism of the body. Getting a fever is the body's natural mechanism to fight off invaders- it helps in two ways, it allows for the immune system to be more active and it slows down the bacteria's ability to multiply. It is a sophisticated mechanism which can be supported and when controlled properly helps us to fight infections much more efficiently. Thyme and Sage: both strong antispeptics with a specific affinity for the airways and lungs. Lemonbalm: Soothing and uplifting- at times of colds or when 'under the weather' people generally feel more miserable, this is partly due to the impact of the immune system activity on serotonin levels in the body- a natural process that ususally passes once the infection is seen off. Peppermint: antiseptic and cooling - but not surpressing any temperature rises. Leaves a nice tingling sensation on the skin and thereby feels very invigorating. Yarrow: Antiseptic, antispasmodic, circulatory stimulant, healing and also a diaphoretic, like elderflower. Tie up and make into ball. Drop the ball in the bath whilst running it. 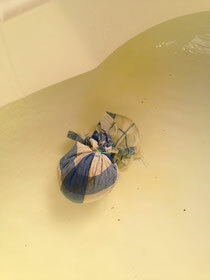 Squeeze regularly and wash down with ball whilst bathing. Relax, enjoy and afterwards rest with a nice cup of herbal tea with elderflower, peppermint and yarrow (equal parts). Happy and healthy festive season!